The agenda for the evening contained much quality merchandise. The brightest gem of all was a finely crafted account of Smith Brindle's classy El Polifemo de Oro. The interpretations were very much of our own time: a meticulously ornamented Tombeau sur la Mort de M.Comte de Logy leading to a robust Falla Homenaje. Credit must be given for the fact that Burley presents a precise realisation of the subliminal quote from Soirée dans Grenade, a significant detail which remarkably few guitarists nail down with total accuracy. This, together with some highly convincing material from his new CD of Giltrap reworkings, made for an evening that found Raymond Burley on excellent form. 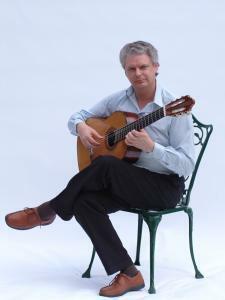 Raymond Burley is an example of the calibre of artiste we are lucky to hear in Guernsey. He began and concluded with music by his favourite composer, Bach, and one could certainly have listened to him doing so for ages. His playing was beautifully clean, without the clicks and whistles one can hear too prominently on some guitar recordings. When he played Sor (op.7) he elicited different sounds, from mellow through feisty to cheeky but the ends of the earlier movements were magically soft. Raymond Burley is a musician whose playing is definitely worth sampling. It was my first opportunity to see the duo and my expectations were particularly high. Double Vision is a superb concept for an evening's entertainment. How to sum up the evening? That's difficult to do in the space that a review allows. There is no doubt there is something special about the interaction between two musicians who are masters of their instruments. It is clear is there is a musical chemistry existing between Burley and Giltrap that is rarely seen and heard. One can only hope that their busy schedules allow them to spend more time performing together. Every piece in Ray's evening concert illustrated something that he had talked about in the preceding masterclass. The tonal changes mentioned in the class were demonstrated remarkably well. In the pieces by Bach, Sanz and Weiss he gave us a live masterclass on decoration: brilliant. Ray followed with the Four Epitafios by Theodorakis, the lesson here: tone control. The use of voicing in Barrios' Julia Florida is critical. I wish I had his control of the separation! He rounded off the evening with Villa-Lobos. 'One day', I tell myself, 'I'll play the Choros like that'. 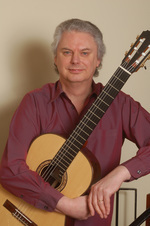 Happily the number of guitarists who not only have technical mastery but can also present programmes with creative originality is increasing, Raymond Burley is certainly in this category. Mr Burley has learnt well and although Guernsey guitarists had the opportunity to observe his technique closely it was not possible to discern precisely how he managed to draw the most exquisite sounds from his instrument. Raymond Burley provided a program that was filled with mastery and was played with the skill a great performer takes to bring the true essence of the pieces to the audience. Mr Burley's ability to garner a wide variety of tone color from the guitar was truly impressive. The music was presented with charm and a marvellous sense of tone color. The playing was beautifully modulated, mindful of the musical structure and filled with tonal variety that was always at the service of the music. Raymond Burley captures the character of the music, as he manages everything else, with an undemonstrative but totally satisfactory assurance; you feel you are in safe hands, that he is never going to let you down by playing something out of period. I have a feeling that this kind of ability is underrated in our concert halls. Burley's musicianship is of a very high order and it makes the recording a continual joy to listen to. If one had to select a single Sor recording to augment a collection this disc would make an excellent candidate. Burley's playing is tasteful and refined and he is in full command of his material. I can't recall having heard the great op.7 Fantaisie played better. I'm always bowled over by Raymond Burley's tone quality, which shone through his entire recital. The performance of Weiss' Tombeau sur la mort de Mur. Comte d'Logy was superb. 'Guitartist' was the word on the back of the programme for Raymond Burley's recital at St James' Arts Centre; misprint it may have been but it was an inspired one. The word should be kept in the language to describe musicians like Mr Burley who have brought the technique of playing a difficult instrument to a very high degree of artistry. Raymond Burley was a great addition to the Distinguished Artists Concert Series. It was a wonderful evening that was enjoyed by all. There was some very competent playing and great musicality. One is free to appreciate Raymond Burley's genuine flair for the 20th century idiom; he was born to play this music. He's totally at home with it, from the early Pujol Guajira (with the pizzicato stridente rendered correctly, for a change) to Duarte's crowd-pleasing Birds and six fresh, un-hackneyed Preludes by Gilbert Biberian. The files below are downloadable versions of the reviews for Press use.